Using K-Seal HD to repair coolant system leaks couldn’t be easier. There’s no need for downtime, and you can have your vehicle back to work straight away with a repair guaranteed for the lifetime of the engine, or your money back. K-Seal HD will naturally separate if left to sit for an extended period. It’s important to shake the bottle vigorously for 30 seconds before application, to ensure an effective treatment. Simply pour K-Seal HD into the vehicle’s cooling system. K-Seal HD can be used in hot or cold engines, and is specifically designed for the more powerful engines found in HGVs, tractors, trucks, and other commercial vehicles. The entire bottle should be used. If you are applying to a hot engine be careful as the cooling system will be under pressure. Do not pour K-Seal directly onto the radiator core. If you are concerned coolant flow is obstructed we recommend flushing the cooling system prior to using any K-Seal products. To effectively locate and seal any leaks in the engine’s cooling system K-Seal HD must flow freely around the system. Bring the vehicle’s engine to its normal operating temperature by idling or gentle driving to let the coolant flow normally. 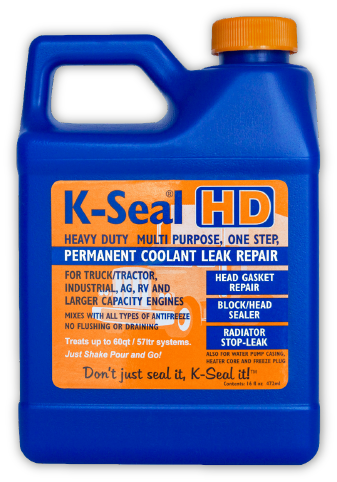 K-Seal HD’s unique formula will permanently fix any leaks in the system, and it is not necessary to remove to formula after use. However, you can flush the system if you wish and any leaks will remain plugged. Important Please use caution when working on a hot cooling system as hot coolant and gases could cause injury. If in doubt please consult a qualified mechanic.